Intel expects tablets containing its upcoming Atom processor code-named Bay Trail will cost under US$200, a company executive said Wednesday. "We believe we can push it well below the $199 price point," said Hermann Eul, vice president and general manager of Intel's Mobile and Communications Group, during a news conference at Computex in Taipei. This is a new low price for tablets with Intel processors. Intel has revised its projected tablet price several times, with the most recent being for tablets between $200 and $399. Now the pressure is on device makers to offer Intel-based tablets under $199. Tablets with Bay Trail will run Windows 8.1 and Android, Eul said. The inexpensive tablets will most likely have screens from 7 to 10 inches in size. Bay Trail tablets will benefit from better battery life and performance, Eul said. The tablets will offer eight hours or more of battery life in active usage, and weeks on standby, Eul said. Users will be able to play 3D games and run office productivity applications on Bay Trail tablets, Eul said. The chip will be two times faster than existing Atom chips, and three times faster on graphics, Eul said. Bay Trail will replace the existing crop of Atom chips being used in a handful of tablets and smartphones. Samsung Electronics and Asustek recently announced tablets containing Intel's current Atom chips. Intel's aggressive approach on price highlights its urgent need to grow its tablet business as PC shipments sink. 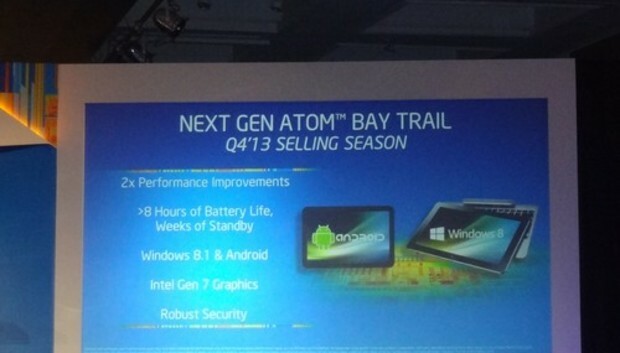 Intel's current Atom processors are used in a handful of tablets, mostly running Windows 8. The chip maker is scurrying to catch up with ARM, whose processor designs are used in most tablets today, including Hewlett-Packard's $149 Slate 7, Google's $199 Nexus and Apple's $329.99 iPad Mini. Shipments of low-cost tablets with small screens are also growing at the expense of larger tablets. Bay Trail is based on the Silvermont architecture, which replaces the five-year old Atom microarchitecture. The microarchitecture brings better throughput and faster and more power-efficient processing of instructions. Bay Trail will support DirectX 11, which would improve the casual gaming experience on Windows 8.1 tablets. Intel will also support Tizen OS for smartphones and tablets, Eul said, adding that the company couldn't share further details about plans for the OS. He did not comment on support for Firefox OS, saying it will explore opportunities for other operating systems over time. Intel's development is mostly focused on Android. Its upcoming Merrifield chip for smartphones, which was demonstrated at Computex and is based on Silvermont, will initially support Android.